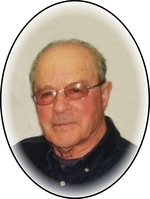 Claude Pierre François Bussière passed away peacefully at the Oliver Lodge in Saskatoon, on Friday, February 8, 2019 at the age of 90 years. Claude is survived by his loving wife, Marina (nee Boutin); his children: Bertrand (Louise), Dolores, Marc (Janine), Martin (Laurie) and Colette (Joey); 15 grandchildren, 17 great grandchildren, his siblings: Thérèse Dornian, Sr. Eveline Bussière, Conrad (Diane) and Sr. Dolorese Bussière; and his sisters-in-law: Thérèse Bussière, Gerry Bussière and Dianne Bussière. The Prayer Vigil will be held on Tuesday, February 12, 2019 at 7:30 p.m. and the Mass of Christian Burial will be celebrated on Wednesday, February 13, 2019 at 11:00 a.m. Both Services will be held at the St. Philippe de Néri Roman Catholic Church in Vonda with Rev. Fr. Rhéal Bussière as celebrant. Interment will follow in the St. Philippe de Néri Roman Catholic Cemetery. Donations in memory of Claude may be directed to the Alzheimer’s Society. Funeral arrangements have been entrusted to Marc Blondeau of Kushneryk Funeral Service, Wakaw, SK, 306-233-4403. To send flowers to the family of Claude Pierre Francois Bussiere, please visit our Heartfelt Sympathies Store.